Halfway Over The Hill: What The F*#% Is Iron Bacteria? What The F*#% Is Iron Bacteria? It's been a bit of a challenging year, 2016, things breaking down and unexpected expenses. 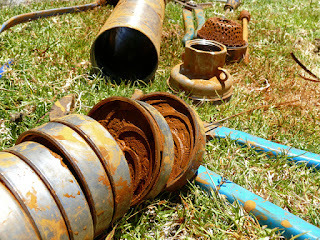 The current pain in the arse is the bore, which has already had its share of issues after last year we discovered the water is pretty crappy and not in abundance. 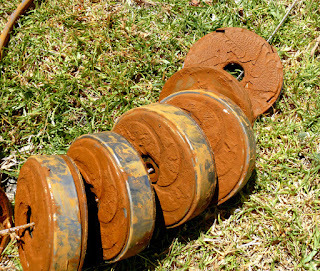 Since then we've spent lots of time researching and putting into action ways to use the water the best way possible, hence things like putting in drip systems so as not to get the bore water on the leaves, and setting up sensors in the bore pipe so the pump moves water to the tank when there is sufficient. Since we reactivated the bore after winter shut-down, it got slower and slower and slower, with the water being pumped into the tank gradually becoming only a trickle, then the pump died completely. The fix-it guy turned up on Friday with his winch and hauled all 50 metres of pipe out of the bore hole, so he could have a look at the submersible pump. Have you ever heard of iron bacteria? Neither had we!!! 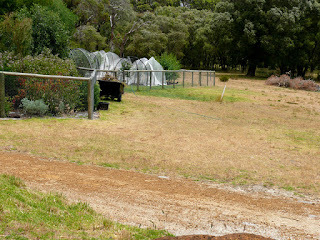 Hence we have had to watch our water usage, so watering grass has been cancelled for now, gosh it's browned off quickly. We've had a lovely drop of rain overnight, and more happening right now, so that is wonderful, the grass should green up quickly. And once we get the stupid bore pump back, all will be well and sparkly green once again. 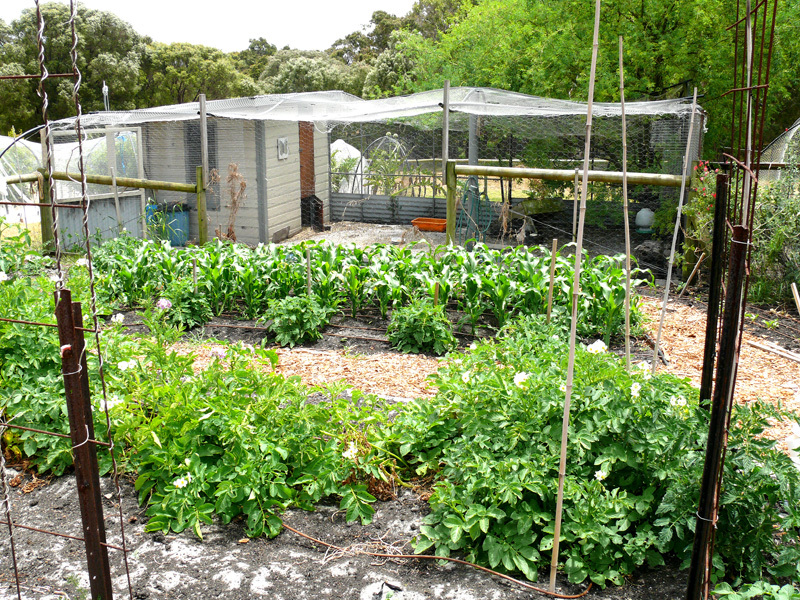 Okay, moaning over :-) All the plants, vegies and trees are looking really really good and growing well. 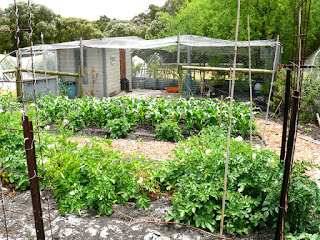 This is the vegie patch, in the foreground are potatoes, we always seem to grow good potatoes. And in the background are sweetcorn. 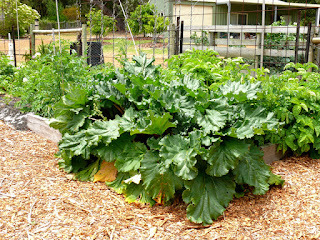 They have grown like the clappers, having been planted late due to the delay of spring, and they are all looking strong and healthy. We've also got loads of small tomato plants and a few carrots, beetroot and red onions. The scarlet runner beans absolutely refused to germinate this year, despite two separate plantings. The weeds are under control at present, what with the mulched paths, plus the fact the drip irrigation only waters the vegies and not the paths, yay! 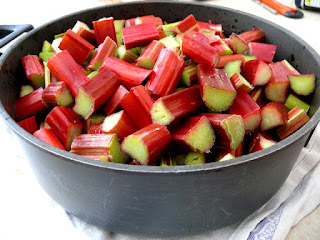 I usually pick loads and cook a big batch, then freeze most of it, so good to be able to grab a batch from the freezer for a spontaneous rhubarb crumble! Now what do you think this is? 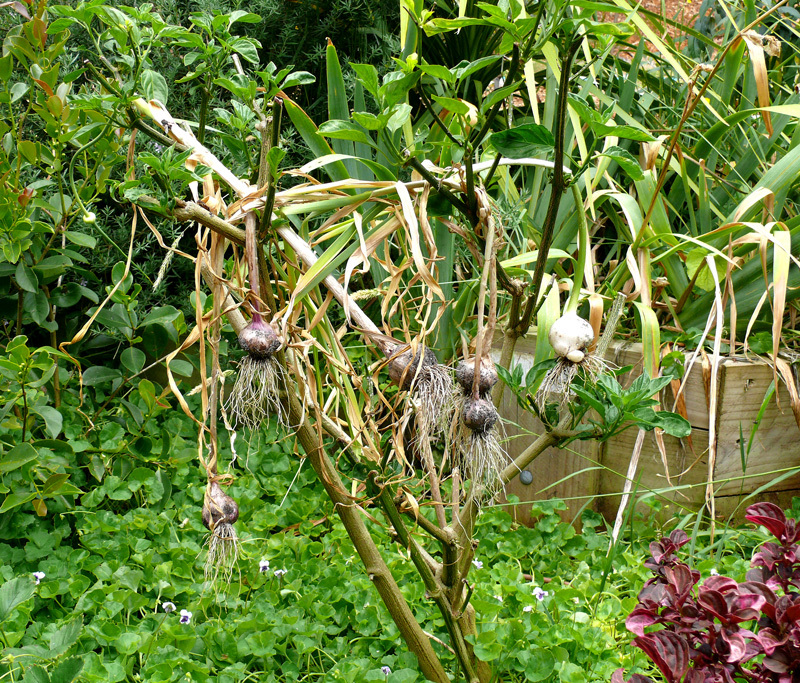 A garlic tree? ha ha. 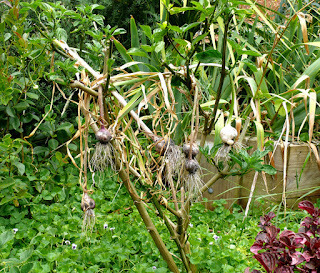 That is the sum of our garlic growing this year, very pathetic, six whole globes, and the only reason we have them is that they came up randomly in my flower garden. 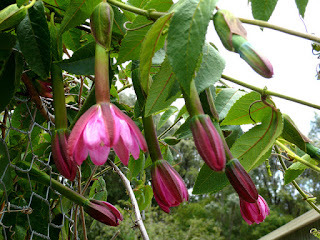 I've hung them over a bare shrub in the photo to dry them out, now they are tucked away in the pantry. Garlic was a disaster this year, the weather was wrong for a start, way too wet for too long, but when Steve went to the shed to get his cloves from last year that he'd put away for planting, he found he'd put some old seed potatoes on top which must have been damp, and the whole lot had rotted. It's probably a good thing in disguise as we want to buy some different varieties of garlic to plant next season, so this will be the impetus for that to happen eh! 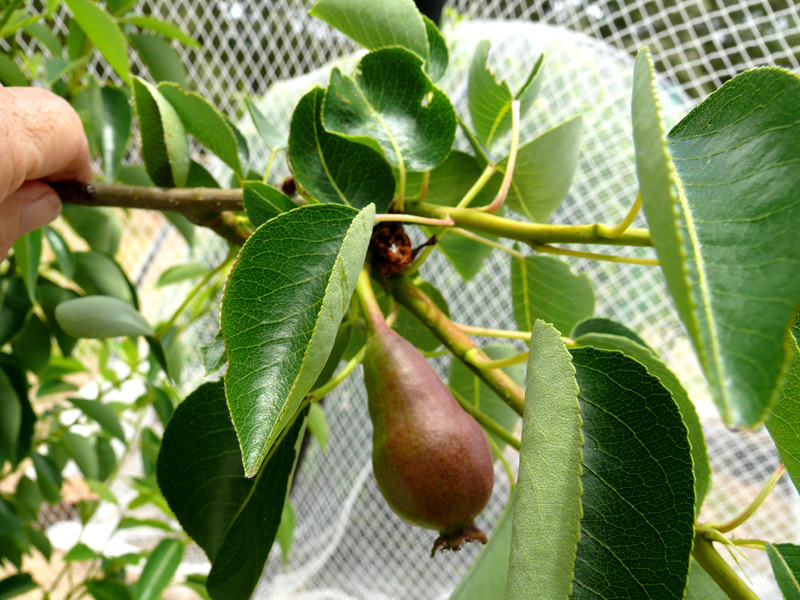 Our Bartlett (aka Williams) pear tree has also put on a wee bit of fruit too, lots of the tiny ones fell off but we have about six growing nicely. I can't wait to try a pear straight from the tree. The plums have been a bother this year, we have three trees, an Italian Sugar Plum which is the pollinator, and a Greengage and Coe's Golden Drop. Unfortunately the sugar plum only had half a dozen flowers on it so what happened is that the other two trees flowered like mad and it looked like zillions of tiny fruit were forming, but they then all fell off because they weren't pollinated. Bugger. 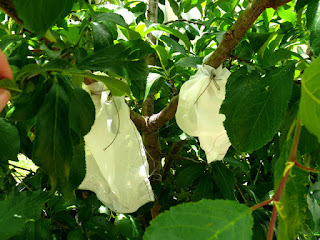 We are thinking of getting another pollinator tree or even hand pollinating with a soft paintbrush if that is possible. Anyway, end result is no fruit on the Greengage or Coes, but the sugar plum has four fruit on it. So I made up little bags from an old net curtain to keep the bugs and hopefully birds off them. Apples apples everywhere, we get the impression that our soil is apple growing soil, they are the least bother, they grow well, flower well and fruit well. This is Sundowner apple tree, a dwarf variety but it is the most productive tree we have. 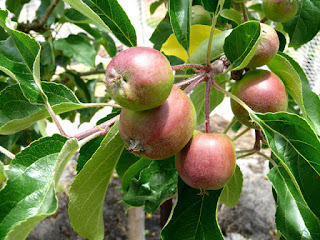 The Granny Smith has quite a few on it too, the Bramley will give us a dozen or so, but for some reason the Cox's Orange Pippin and the Red Fuji are quite sparse this year. It's all a big mystery this fruit growing hey! Our stubborn mandarin tree has finally seen the light we hope. 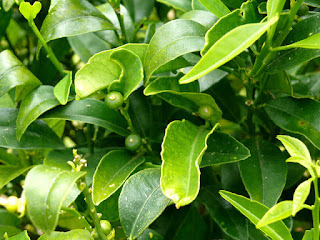 It's been in the ground for five years, tried hard to die for the first three years, gave us one mandarin last year and this year so far it has lots and lots of tiny fruit. Crossing fingers that they don't all fall off. The fig trees have been really late getting started this year with the cold, wet spring we had. 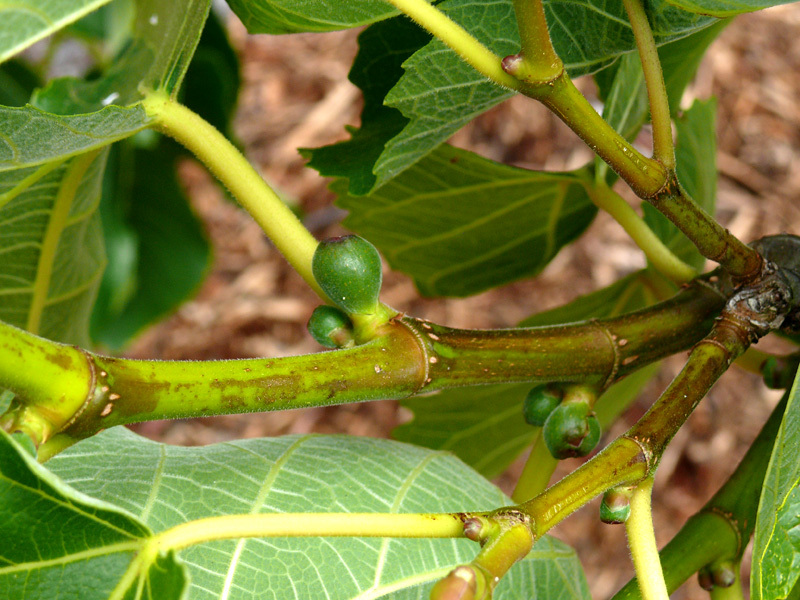 But there are signs of tiny figs happening. Whether we or the birds get to eat them will remain to be seen! 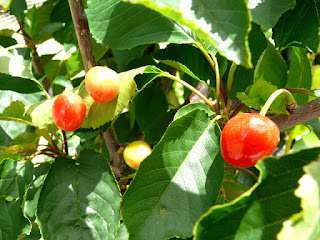 It's been such a learning curve growing fruit here, although the fruit production is up and down, all the trees are growing well and look strong. Even the poor stone fruit trees that had such terrible damage from leaf curl virus, have finally started growing healthy leaves. It's so interesting though, there's nothing I like better than finding a problem then settling down with books and the internet and educating myself on how to fix or at least improve things. The wonderful banana passionfruit vine just keeps on keeping on. 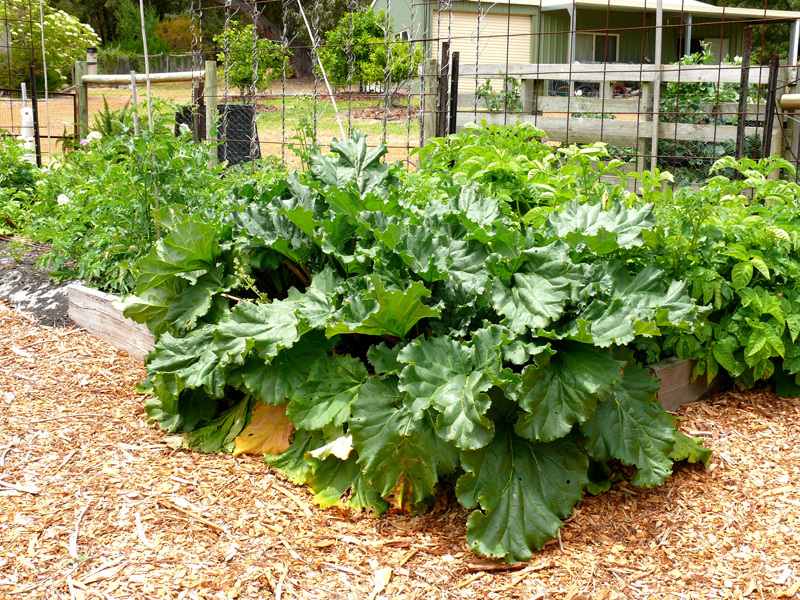 I keep it well watered and fertilised and it rewards us with beautiful flowers and fruit all through winter, and it's revving up with another crop now. Like everyone, we are busy getting organised for Christmas, tidying up, shopping, making lists, working out beds. This is a photo of me wearing my dear mother-in-law Barbara's Christmas present. Barbara has Alzheimers, lives in a nursing home, and she spends most of her day walking, particularly outside, so I thought a nice big hat would be a good gift for her. 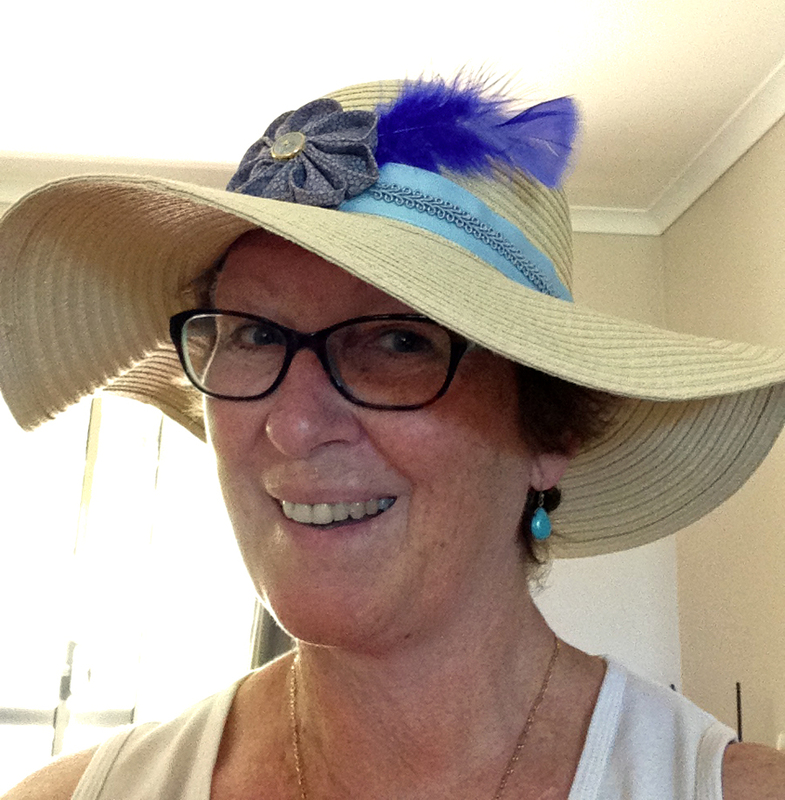 I didn't like anything I saw in the shops, so I bought a big, comfortable, plain hat and blinged it up for her with some ribbon, lace and a handmade flower and a feather. I rather like it! I hope she does too. What an interesting blog. Hopefully by now the pump is fixed and pouring pout the water for your great vegetable garden. I would die for your rhubarb. Mine is all green, spindly and tough.